Blue Water Farms is a farm within a farm. We offer many services including field trip destinations for schools and camps in Broward, Dade and Palm Beach counties. We also offer to bring our mobile farm to local preschools. BWF is home to chickens, turkeys, geese, ducks, bunnies, pigs, goats, sheep, donkeys, horses, ponies and a cute little alpaca. 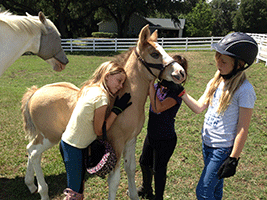 Our animals are all raised from babies as family pets and are very clean and friendly. We have beautiful adult animals as well as cute little babies. All our animals are so very amazing because they have grown up with adults and children loving them since they were born and that is how they are all so sweet. We built a community for our farm animals with cozy individual structures that we nestled on beautifully manicured acres in the heart of Broward county. Blue Water Farms allows schools the opportunity to visit our farm with their students during the school year. Our farm tours last 3 – 4 hours and include time for students and teachers to enjoy a relaxing lunch outside in our shaded picnic pavilion. Our tours are educational, giving students the opportunity to learn about animals and see a real working farm. 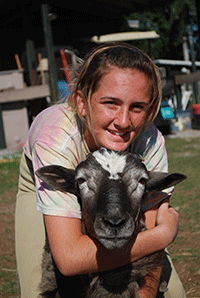 Students will get hands on experience and be able to touch and feed many of our animals. We encourage schools to reserve their tour dates as far in advance as possible. We take reservations up to a year in advance. During the summer, winter and spring break Blue Water Farms offers camps the unique opportunity to bring their campers to our farm for an up close encounter with farm animals. Our tours are very popular with local camps and our available dates fill quickly. This tour is similar to the school tour and can be customized for each individual camp. Our mobile farm is a great way for the preschool child to have hands on experience with many different animals. Blue Water Farms brings a large portable pen with a shade canopy to your school so the students can have a chance to touch many different animals. Most children have never seen or touched a real farm animal before. Our farm has always been a favorite among children and teachers. 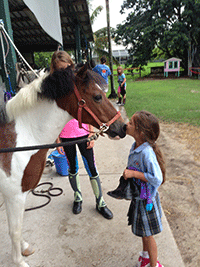 All of our animals are sweet and clean and we try to bring as many babies as we can for the preschool child. Encounters last approximately 15 – 20 minutes per class. Our mobile farm is only available during the cooler months of November through March. This is the most comfortable time for younger children and for our animals. Please reserve your dates as early as possible because we only offer a limited number of bookings for our animals.